The days are hot and the mornings are cool. Each day dawns with fresh air coming off the coastline and caressing its way over the ancient hills making its way to my front door. I take a deep breath in and often find that breath followed by a heavy sigh. Each breath finds its way out of my body and a little bit of me is exchanged with the bigger breath of the universe and the cycle begins all over again. I rarely take a moment to give witness to this miracle every day, but when I do I recall that what I am doing is inspiring. I am in-spiring, drawing in the oxygen to fuel my body, soul and mind. Filling myself with inspiration gives me energy and joy. Of course the opposite is to breathe out and expire; and maybe that is what happens when my breath is joined with the bigger breath or the universe. Waiting for inspiration is learning to take a deep breath and allowing the air to flow into your lungs and fill you and in turn the inspiration will flow too. Did you take a deep breath every day Biddy and be filled with the air of County Clare? This past week there have been a few occasions to take in some deep breaths and allow myself to be inspired. I have breathed in the heavy hearts of some people around me facing disappointments and disruption in their lives. I have breathed in the exquisite joys of others learning and discovering more of themselves being alive than they had known possible for some time. I have breathed in the harvest of poetic endeavours and an invitation to take another step in my own writing journey. All of these breaths in brought me gifts and I am a very grateful recipient. 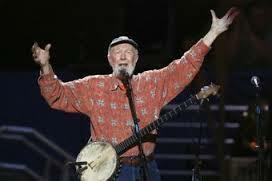 I took a very deep breath in this week Biddy when I heard the news the Pete Seeger had died. I watched a wonderful interview last year where he talked about what he would do when he turned 100. His wife and lifelong companion had not long gone and he was still in mourning. He said that on his 100th birthday he would have an enormous party with all his friends, music and singing and dancing. When the party was over he would stop eating and drinking and that would be it a complete and celebrated life and an expiration worthy of his life and works. He was 94 so his dream of ending his time on this planet was not realised. But in his life he saw the end of segregation in his country and the election of a black President. He set up a not for profit to clean up the Hudson River and last year said it was now clean enough to swim in. He sang This Land is Your Land (all the verses) at the Obama inauguration. He was blacklisted with many others during the McCarthy years was put on trial and sentenced to gaol (he was later acquitted). He helped a nation find its voice and there would be no Peter, Paul and Mary, Bob Dylan, Joan Baez, Bruce Springsteen among many other US (white) activists without him first blazing the trail. He knew that things would change and that ‘we shall overcome’ is the song to sing change into being. 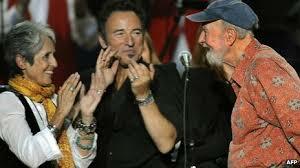 I loved his rendition recently of Dylan’s Forever Young singing it in his 90s with little ones. It is a family favourite we have sung at each of our children’s birth and some special birthdays. My personal favourite has always been If I had a Hammer that defined Pete Seeger and the American folk music activism for me. I sing it with gusto and a lump in my throat all at the same time sometimes! It has held me through many a moment that I needed to be inspired and to breathe in. So I remember Pete as he expires and we all get a little of his breath into ours and I look forward to seeing Bruce Springsteen in concert and am expecting a Seeger tribute to keep me hammering on about justice, ringing that bell of freedom and singing that song about love.